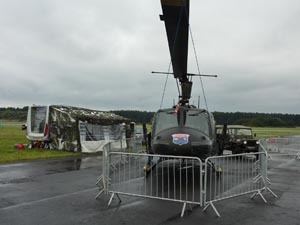 After a hiccup last year with us not being able to attend the Woodvale Rally, Huey 509 returned for the 2009 gathering. This year was to be different in many ways. The first year we attended Phil and I flew in on the Friday afternoon with our essentials packed in the Huey (namely two pup tents and a couple of small gas cookers, etc). We were helped by Bradley and a friend of his. It turned out to be a very busy and very hot weekend. The second year we had with us a frame tent along with Bradley and the ML motorbike. So to this year….. we had many more creature comforts as we were taking the 'chuck' (the Huey Motorhome) with the Huey Smart Car in tow. 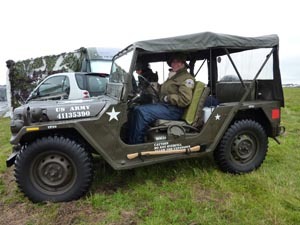 With the usual Ground Crew otherwise engaged and the Mutt wasn’t due to arrive until later, we enlisted the help of the MVT (Military Vehicle Trust) guys who were on site to help tow the Huey to its location for the weekend. By the time I arrived just before 9 pm Phil and Bradley had managed to erect the full awning on the side of the Motorhome. They had also erected the railings around the helicopter with room for the MUTT and another jeep. Phil and Bradley would fly 509 into and out of Woodvale. Norman Parkes, Woodvale Rally Organiser, having had experience of the same kindly agreed to step in as Ground Crew and guide Phil to the landing spot on his approach and to ensure no-one came beyond the safety barriers. All pretty much sorted we sat down to a meal and a well earned drink and watched a film we hadn't seen for a while ……… Platoon; and true to form, one Crew Member once again didn't see it all due to nodding off!! It was a fowl night with the rain hammering the roof of the Motorhome and the wind buffeting it. 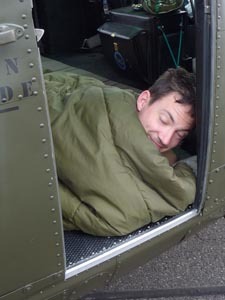 Mind you, it could have been worse, we might have had to sleep in Huey 509 overnight on security duty……..ooops, sorry Bradley did that! After a night of cat napping we got up at 7 am with the rain still falling. 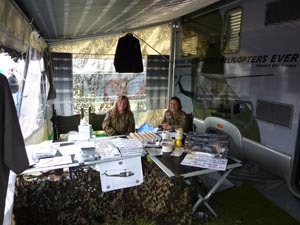 We sorted out the awning with the tables and stock boxes so that we would be ready when the gate opened to the public. Shortly after 9 o'clock the girls arrived in the MUTT and they immediately set about arranging the Shop how they wanted it (we men haven't a clue about how to set out display items attractively!). 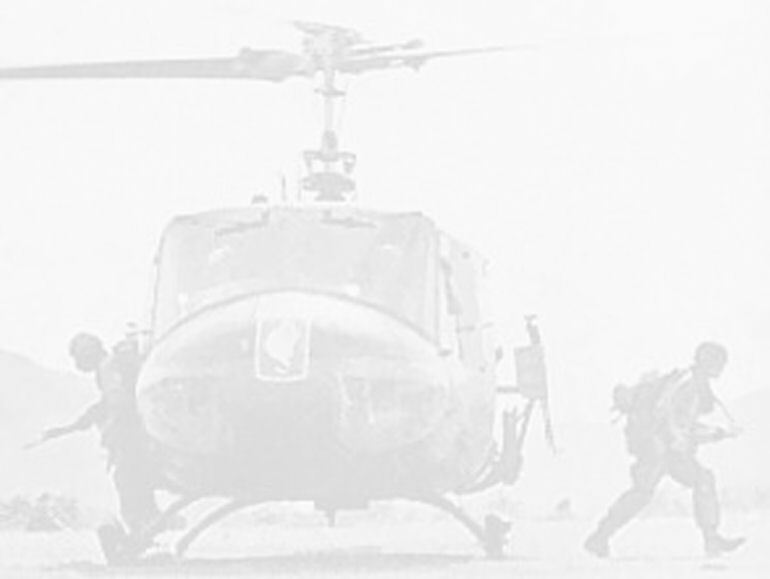 We left them to it and went outside to set up the Huey. 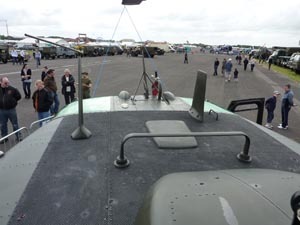 The .50 cals were mounted in the posts and the ammo belts fed in the weapons. The doors we pinned back and the front right hand door secured open so the cockpit could be seen. From that point on Phil and I were on our feet talking to everyone that wanted to know more about 509 and its history. As the day progressed the weather got better with the sun coming out and beginning to turn both of us rather red. For over eight hours we were bombarded with questions from an enthusiastic crowd. The girls held the fort in the shop, ably assisted by Shop Supervisor Taggart and had quite a number of customers. During the afternoon Mark and Judith joined us to swell the numbers able to help with talking to the public and standing in when any of us needed a short rest. We cracked open a new roll of the small round Huey stickers which we give out to the children who come to have a look at 509. By the end of the day we had given away several hundred. Throughout the day the modellers flew their aircraft whether they be fixed wing or rotary. It was just amazing to see some flying including the huge Vulcan. Other large aircraft were a Whitley bomber and Lancaster. Saturday unfortunately saw a couple of crashes from the modellers; the first to argue with the ground was a helicopter, second was I think a very large scale Lancaster bomber. The remains of which were recovered later on in the afternoon. Saturday early evening the BBQ was lit and after a convivial meal we headed off down the runway to see what was going on. There we found a local band performing live on a forty foot artic trailer that was the stage. There was a display of customised Chrysler PT Cruisers; just amazing what these guys do with their cars with light, paintwork and sound systems. There were also a group cycling around on bikes totally bedecked with led lights, including themselves. It created a real spectacle. We wondered back and turned in for the night. Sunday morning the sun was out and the wind slightly stronger. We opened up the awning and set up the shop once again along with putting the guns back on the Huey. Saturday had been busy but by crikey Sunday was heaving. This time I plastered myself with sun screen and kept following the shadow of the blades to try and not over expose myself to the sun. Phil on the other hand was at the mercy of the sun as he had not got any shade to take advantage of (apparently he was rather red for a few days after!). Becky and her husband Tony came along to see us and to make sure we were behaving! 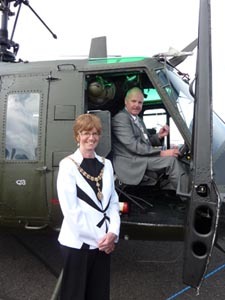 We also had an unofficial visit from the Mayor and Mayoress of Sefton. They returned a short while later to have their photograph taken alongside 509. The local press also turned up to take a few pictures. The day flew by with the little stickers being given out at a rate of knots. The girls did a brisk trade at the shop and Taggart did sterling work greeting everybody and anybody who came to browse. All too soon it was time to ready the Huey to fly out. While Phil started to do his checks the rest of us started to pack up the stock and the awning. 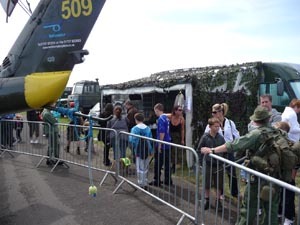 By the time the aero modellers had finished their flying skills with their Battle of Britain display, with the help of a few pyrotechnics, we were ready to pull 509 out onto the runway with the MUTT. Slowly and gently we pulled her to a safe distance from the flight line fence and swung her nose into the wind. 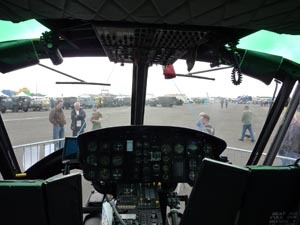 The ground handling wheels were loaded in the Huey and lashed down and the front doors of the rotors were removed. Phil and Bradley went and got the rest of their flight gear that they needed and then clambered aboard. The two of them went through the start up procedure and as Phil pressed the starter button I monitored what was happening outside making the final checks for leaks and that everything was properly secured. Happy all was ok I retired to a safe distance to watch 509 take to the skies over Woodvale. 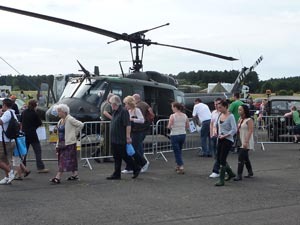 Huey made her usual noisy departure with a bit of an air display thrown in, much to the delight of those who were still on site. Apparently a number of people had headed to Southport Pier after leaving Woodvale to watch for Huey flying over! Mark and Judith having finished loading their gear into the back of their Jeep headed off to Adlington and with the Motorhome loaded up we headed back to Wesham. 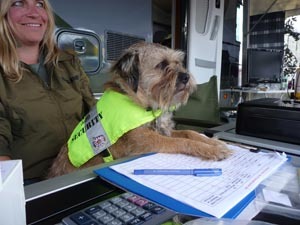 Jo and Nina were driving the MUTT and Taggart took pity on me and rode shotgun in the Motorhome, soon falling asleep after a very tiring but fun filled weekend. Our thanks to Norman and all at Woodvale Rally for an excellent Event. Also a big thanks to everyone who helped us out over the weekend and for those that made the trip to Woodvale especially to see Huey 509.